This week at Hand Stamped Sentiments we’re having a color splash challenge with the colors of Hello Honey, Night of Navy and Marina Mist. My card was inspired by one in the Stampn’Up! Idea 2014-2015 Idea Catalog on page 69. The card base is Whisper White and I rounded one of the corners of the card by tracing a half circle on the corner then cutting the round with scissors. I stamped the flourish with Hello Honey from the Flowering Flourishes stamp set then adhered a Tea Lace Paper Doily. I stamped two flowers from the Beautiful Bunch stamp set. The larger flower I stamped with Momento black ink and colored it with Night of Navy and Marina Mist markers. The smaller flower is stamped with Marina Mist. The sentiment and butterfly are stamped from the Kinda Eclectic stamp set. I die cut the flowers with the Fun Flower and Petite Petals punch. I used the Elegant Butterfly punch to die cut the butterfly. The sentiment was die cut with the Apothecary Accents franelit. The inside of the card is layered with a Hello Honey striped paper from the Lullaby DSP. The designers at Hand Stamped Sentiments have more projects to inspire you. 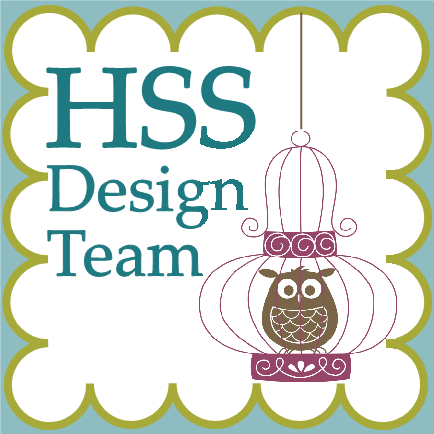 So hop on over to HSS and join the challenge.